Roughly half a year after its initial release, it’s certainly no secret that The Last of Us has left quite an impression with those who played through the game. Among the many reasons why it made our top three in our “Best of 2013” awards was its terrific writing, cast of characters, and captivating storytelling, so when we got word that single player DLC was confirmed, you can bet we were pretty excited. While it can be assumed that players interested in the DLC have finished the game, for the sake of respect for our readers, I’ll try not to go into too much detail with both The Last of Us and Left Behind—besides, it hasn’t even been a year since the original game’s release. 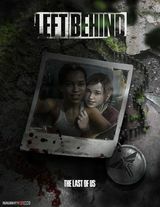 Left Behind puts players back in Ellie’s shoes, both a little bit before and during the events that transpired in The Last of Us, giving players an even deeper understanding of who Ellie was prior to her bite all the way to her quick yet premature transformation into adulthood during her travels with Joel. As players might remember, while Joel was the main playable character in the original game, Ellie was also playable for a brief period of time, and it’s in this same time period where she becomes playable again in the DLC—when she becomes a fully fledged survivor. Ellie had the misfortune of having to grow up in this post-apocalyptic, but to her fortune, so did others. The DLC begins with Ellie sleeping in her room, until another youth pounces and pretends to bite her like an infected. Scared and surprised, Ellie throws the other girl to the ground and pulls a knife out only to see that she was woken up by her best friend Riley who apparently has been MIA for month and a half. Riley then unveils to Ellie that she has become a member of the Fireflies, an anti-government militia group that seeks to restore political order in the wake of military oppression. Given Ellie’s presence in a military camp and receiving military training, Riley is basically an enemy, but it’s not about that. Left Behind is the story about Ellie and Riley’s friendship and how it is put to the test because of the world these two teenagers live in. The story is told using a series of scenes jumping back and forth between Ellie’s spontaneous excursion with Riley and the point in time in which Joel sort of left Ellie behind. Ellie and Riley get over their brief argument the same way any kid their age does, by getting distracted. This point in the game actually gave players some flexibility. 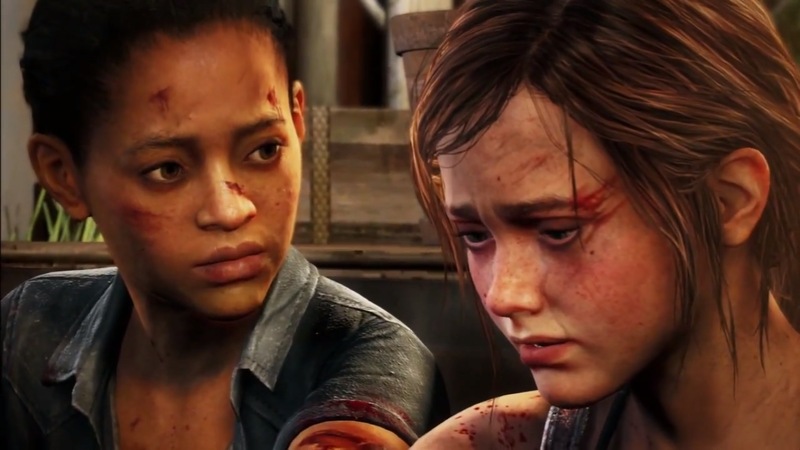 You don’t have to interact with the magic eight-ball, but I found myself asking as many questions as the game would allow because not only was I getting a kick out of the dialogue, I really wanted Ellie to enjoy whatever time she had with Riley and whatever time she had to be a child. There’s even a point in the game where Ellie can read selections from a book of puns while walking through the mall. 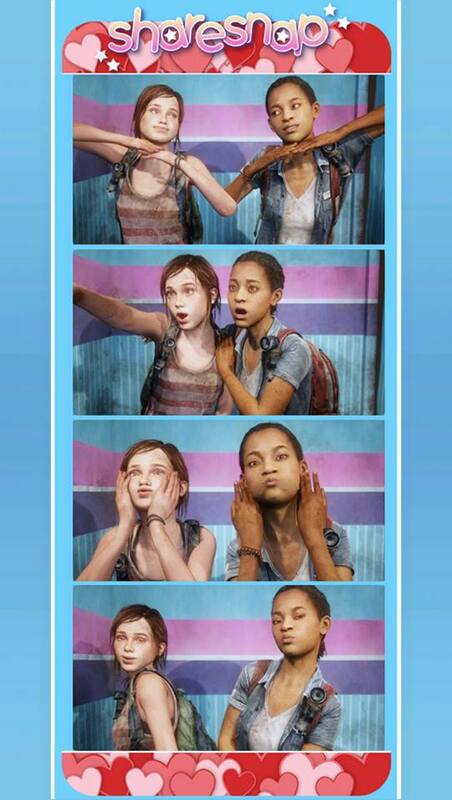 It’s the little things like this that really show the excellence of the game’s writers, and it gives players an appreciation of this friendship that Ellie had. But it’s also here where players are unfortunately met with a glimpse of what this sad world has done to them. Yes, we know what’s going to happen to Riley. Still, it’s a joy to see these two have fun, and it gets real when they realize that everything they’re doing is foolery. In the Halloween shop, Ellie questions why people would waste their money on such things and eventually despite all the fun they’re having, reality kicks in when Ellie realizes she shouldn’t even be hanging out with Riley. Of course, this wouldn’t be The Last of Us DLC without its spurts of combat. Most of this happens during Left Behind‘s flash forward to the events in which you use Ellie in the original campaign. Equipped with a knife and gun with no ammo, Ellie still has to trudge her way through packs of infected and survivors out to kill her and Joel, but here’s the kicker; surprisingly, never in the original game did players get to see live survivors interact with the infected. 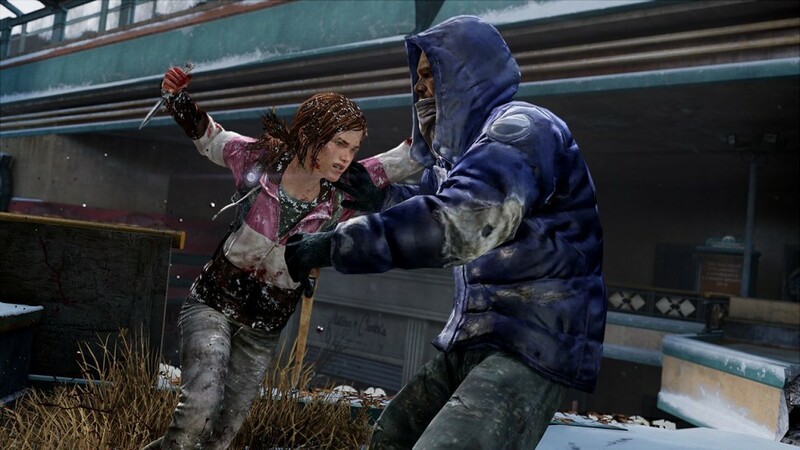 We get to see this happen in Left Behind, making things easier for Ellie not having to kill as much she normally would have to. Crafting weapons and health kits also makes its way back into the game, but it’s not relied upon as much as it was in the original campaign, and this is good because it shows Ellie’s immaturity. Of course she’s not going to be as skillful or as willing as Joel when it comes to making needle bombs or exploding bottles of alcohol. Either way, it’s still quite pleasurable seeing infected walk into a fire and burning themselves to death. The game probably could’ve done without the crafting system, though, because it pretty much contradicts her lone adventure in Left Behind. The reason why she’s alone in the first place is to find some medical supplies, and she finds some bandages and alcohol during the exploration but never returns to the camp. Yes, this is solely because you need something to heal yourself along the way, but it’s still a detail the developers probably looked over despite what good writing the game has. 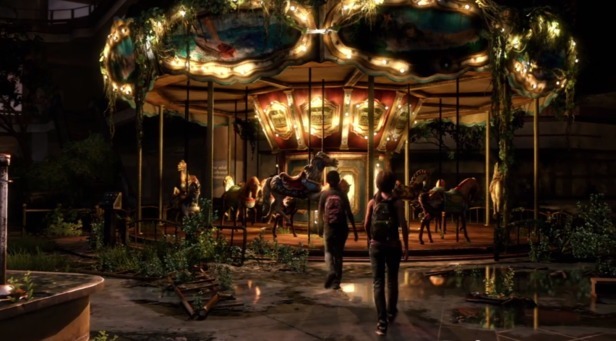 Fans of The Last of Us will have a lot to like, and love, in Left Behind. Ellie, for me anyway, is one of the deepest and most likable characters I’ve ever come across in gaming, and I really appreciate the depth and detail Naughty Dog put into making her as authentic as possible. The original game put players in the shoes of a broken man that had to learn to take a liking to Ellie, while Ellie had no choice but to follow him and eventually grow attached to him. Left Behind has this same buddy system but under a different light—Ellie is hanging out with her best friend who also happens to be a superior survivor and even a traitor, but the game’s themes of love and friendship do a great deal in preventing any kind of rift the two have. There’s even this photobooth at the mall that allows you to post to Facebook. If there’s anything to complain about with the DLC, it’s that the game is pretty short. Depending on how quickly you get through the optional conversations and sometimes difficult action sequences, the average player can probably be done in around a couple hours. Now if you bought the $20 season pass and don’t make use of multiplayer, then it’s safe to say you probably blew $5. But is it still worth the $15? I’d say so, especially if you’ve grown attached to Ellie the same way I did.